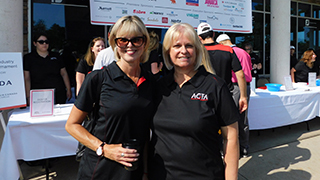 ACTA President Wendy Paradis (right) and Air Canada’s Jennifer Backus welcome participants to the 30th annual ACTA Ontario Golf Tournament. Preparing for the shotgun start. 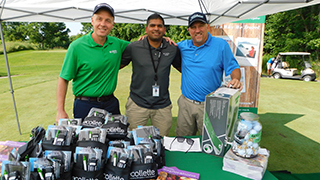 The Collette Team: Ron Lonsdale, Ryan DeSouza Todd Bridges. Rod Hanna, Trade Sales Manager, Saint Lucia Tourism, and Chris Stubbs, President, One World Marketing. Softvoyage sponsored theladies’ longest drive prize. Here’s Softvoyage’s JC Girard with the winner, HAL’s Lori Patterson. Air Canada’s Chantal Podgorski hands over the grand prize of two Air Canada tickets to Europe to Transat’s Dan Prior. In journalism, ‘30’ marks the end of a story. 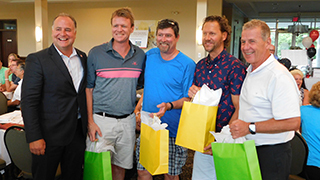 But after the 30th annual ACTA Ontario Golf Tournament delivered another sold-out success at the Royal Ontario Golf Club in Milton, there are sure to be many more ACTA golf stories to come. It was a hot day and a full house – close to 150 golfers (in my case the term is used loosely) and another 50+ sponsors and dinner guests were on hand. In typical travel industry fashion, competitors laid down their weapons for a day of fun and fellowship. Hydration and keeping cool is key when it’s 30+, so the PAX News-sponsored ice cream cart was a hit. Travelport offered a putting game with liquid prizes and the St. Lucia-sponsored beverage cart worked the course at a feverish pace to keep up with the notoriously thirsty travel industry members. Title sponsor for the event was Air Canada, along with its Rouge, Vacations and Cargo divisions. Manulife, Hawai’I Tourism, Visit Myrtle Beach, Enterprise Holdings, Mexico, Explore India, Allianz and Jamaica were other major sponsors. 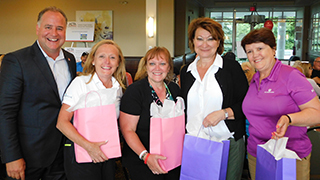 ACTA President Wendy Paradis and other ACTA team members welcomed golfers on arrival. 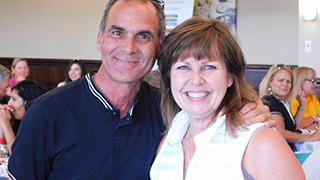 She told Open Jaw that the ACTA golf tournaments across the country are a great way to bring together busy people who may not have seen each other since the last one. 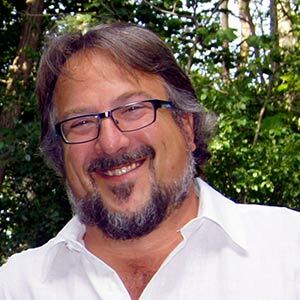 “It’s all about relaxing and having fun, and there’s always some networking going on,” Paradis said. 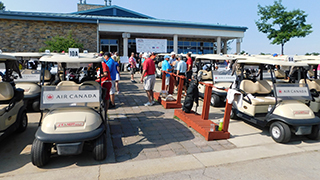 Networking was encouraged with sponsors on hand at each hole, and the languid pace of golf meant lots of time for conversation. 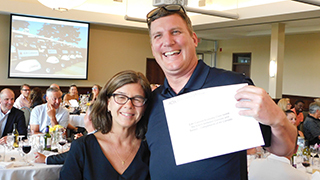 The day wound up with a raft of raffle prizes awarded, from golf foursomes to hotel nights, VIA Rail tickets to the grand prize of a pair of Air Canada flights to Europe – shamelessly won by Transat’s Dan Prior. The story isn’t finished without a shout-out to Collette Canada for inviting Open Jaw along for the ride. 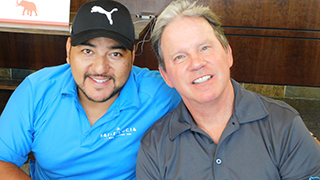 Collette’s Canadian VP Ron Lonsdale and VP Global Partnerships Todd Bridges, along with Travel Industry Today’s Mike Baginski, made for fun and friendly teammates – until I lost the scorecard with a couple of holes left to play. Then things turned ugly. But that’s another story. There was money raised for good causes at the event as well: ACTA raised $1,035.00 in support of Tourism Cares and Blue Cross raised $950.00 in support of the Children’s Wish Foundation.